Have Courage + Love Prints! 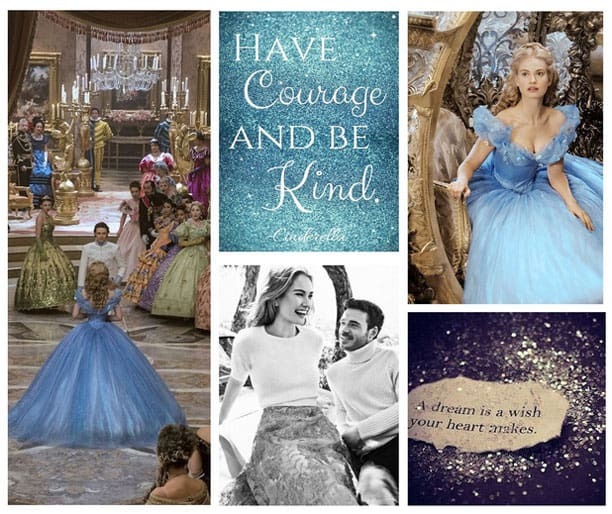 AFTER WATCHING THE LATEST CINDERELLA MOVIE, I WAS MORE IN LOVE WITH THE INTERIORS, COSTUME DESIGN AND GENERAL STYLING OF THE MOVIE THAN I WAS WITH THE STORY! The beautiful locations and lavish interiors really were distracting from everything else that was going on. (Stop! rewind! what was that wallpaper on the stairs?!!) Her family home was for sure, gorgeous, with Chinoiserie wallpapers all over the walls and antique furniture that had been given a modern update. With a great English cast (Loved Daisy from Downton as one of the step-sisters!) the story swept you along, all the while looking at sumptuous patterns and colors. The lavish feel of the set designs are so amazing, that you could really feel the grandeur of the palace and the quaint vintage style of Cinderella’s family home. The huge blue dress she wears to the ball is in a stunning shade of aqua blue, which coordinates so well with the opulent gold carriage. I also loved the saying that her mother had taught her - “Have courage and be kind” what a great quote to remember! British textile designer Carolyn Quartermaine’s work has the perfect look for my imagined Cinderella home. The beautiful printed textiles that have a mix of old and new, work in a feminine setting, offering a pretty, chic living space. I can envisage Cinderella loving the printed textiles and happily talking to her animal friends in one of these rooms! 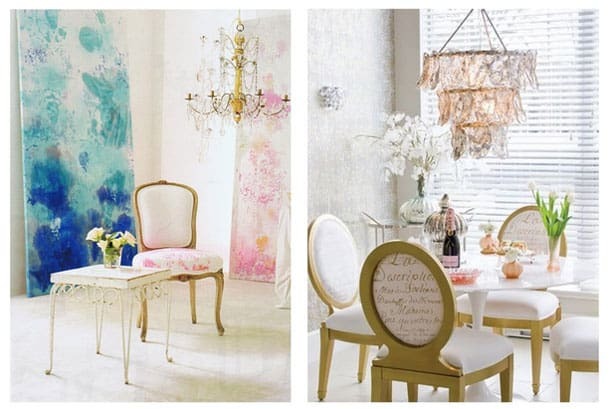 Printed textiles in pinky hues make the rooms in these images look contemporary and feminine. The middle image of bolster pillows draped in bright screen printed silks, look stunning together as the colors are so vivid! The modern Cinderella could live in a minimal space like this if she wanted natural light and bursts of bright color that hint at the Baroque style. I would love to have some pillows in my home made from Carolyn Quartermaine’s printed silks! A beautifully wrapped chair with folds of silky fabric, gives the feel of something precious next to an image of a chair that has been upholstered with a text printed fabric. The gold lettering looks like a handwritten letter, perhaps a love note? (from the Prince to Cinderella? 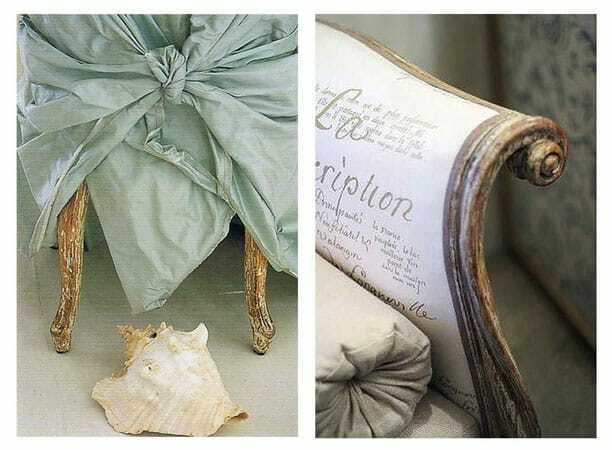 (heart)) The bolster pillow adds to the Baroque styling of this chair which has a stunning vintage quality. 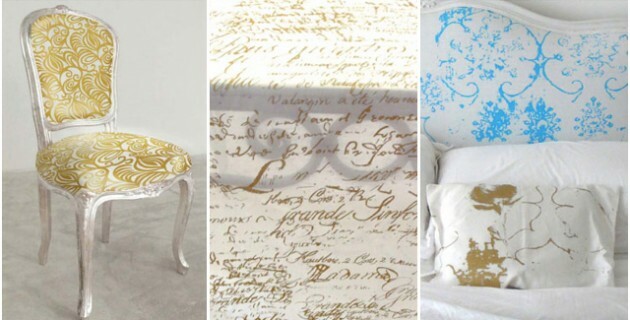 I would love to have a chair that has old style typography printed onto the fabric, that would be so cool, especially if it was something I had written myself! What would Cinderella’s bedroom be like in the Palace? I can imagine something luxurious with folds and folds of fabric and the color blue. I found three images to share with you that look like something straight out of a fairytale! Could you even imagine sleeping in a bedroom like this? The amazing shades of blue combined with gold trimmings look like they have been inspired by Cinderella’s ball gown and carriage. The extravagant four poster bed is draped with silk curtains that look fit for for a princess. The doorway is also draped with fabric and given a tall grand look. There are so many details in this room, including the ceiling, with intricate gold carved patterns. I’m not sure if anyone would be able to relax in this room as there is so much going on visually! 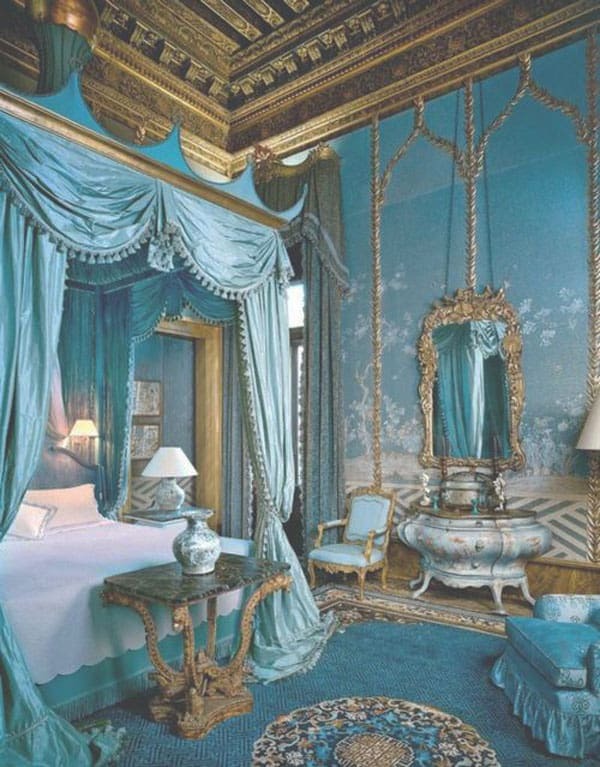 Although you would certainly feel like royalty sleeping in a bedroom like this! A gorgeous bedroom with a modern vibe, features an ornate chandelier that is highlighted against large windows, with a view to the grounds outside. The minty green, leafy wallpaper is heavily patterned but not overpowering, allowing the other details in the room to stand out. The lovely four poster bed has an intricately stitched bedspread in that lovely grey-blue shade, that coordinates perfectly with the wallpaper and other features. I would love to have a bedroom like this, the windows are just so incredible! 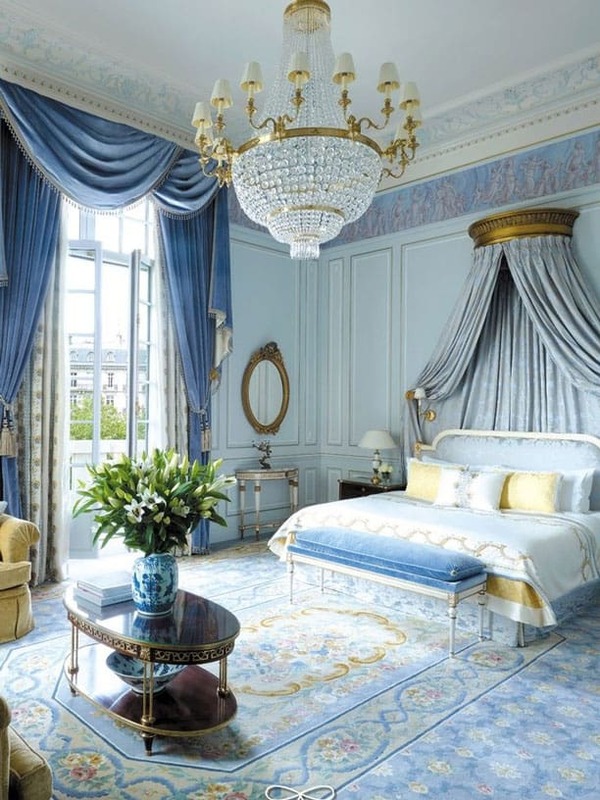 Another regal blue room that has gold trims, this grand bedroom has lovely blue velvet drapes framing the gorgeous veranda doors. The heavily patterned rug matches the softer color palette from the room and adds a feeling of femininity. The coordinating soft furnishings blend well with the home decor accessories. This bedroom has a more traditional feeling, so I could see Cinderella redecorating, adding some contemporary pieces in the style of Carolyn Quartermaine! With updated textiles and a different rug, this room could look really fresh! WHAT DO YOU THINK OF THESE ROOMS? CAN YOU SEE CINDERELLA MAKING HERSELF AT HOME HERE?